When Frank sent me a copy of his latest book, I was keen to read it because I knew it looked at the lives of Mary and Martha and their brother, Lazarus. God’s favorite place when he lived on earth was their home in Bethany, the place where Jesus was accepted unconditionally and where he returned, time and time again. Part fiction (the moving story of Jesus in Bethany is narrated by Lazarus) and part insightful theology, Frank uses the story to help people facing many kinds of challenges–doubt, discouragement, fear, materialism. He demonstrates in a practical way how to deal with offense, both by God–when he doesn’t meet our expectations or doesn’t show up on time–or from others who may hurt or reject us. He challenges us to live a life free from offense. I’ve studied the Gospels on many occasions, but certain things became clearer to me as I read this book. I saw details that had escaped me before. Example: I’d never noticed that Jesus’ ascension occurred in Bethany. The conversation between Jesus and Martha about his resurrection took on fresh power. 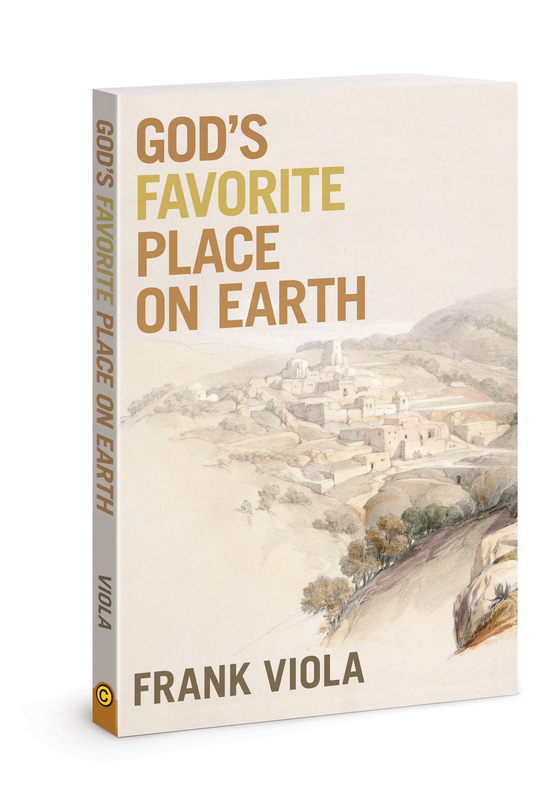 For those who purchase God’s Favorite Place on Earth between now and May 7th, you will get 25 free gifts. You can find out how to claim these here. I purchased God’s Favorite Place on Earth, and went to access the 25 free gifts. While I’m looking forward to reading Frank’s book when it arrives, I downloaded your A Simple Guide to Hearing God and couldn’t stop reading it. It’s wonderful! Thank you for sharing it. I’ve been telling Him how I long to commune with him, but my mind seems so very distracted. I do hear from Him when I’m ministering to people, but I feel so HUNGRY for His voice to ME! I’m wondering about something you wrote. You’d said that after you came to the States God stopped speaking to you and Tony. What happened? Why do you think that was? How did you come to hear from Him again? My husband and I have been a “church of two” these past three years here in CA. We are praying that the Lord will build His body in our little town, and so I really appreciated what you wrote about gatherings. Here’s the story: We arrived here in Austin knowing no-one. And it felt as though God took the next plane back to the UK. Three really tough things happened pretty much simultaneously. God stopped speaking (prior to this we had know huge blessing and clear guidance back in England), no one wanted to employ two unlicensed physicians and we didn’t fit into the American church culture which was very different from what we were used to. When I say that God stopped speaking, I don’t mean that I wasn’t blessed reading his word etc etc, but he didn’t guide us clearly or speak to us in the ways we were used to. This was the hardest part. I’d like to tell you I handled the situation with grace and dignity, but that wouldn’t be true. I fussed and grumbled at God, complaining at why he would bring us here to the States only to desert us. This went on for nine very long, very painful years. What was God doing? I think he was preparing us for what was to come. During that time we had our understanding on a number of things change. We had the “entitlement mentality” that often comes from being supported in full time ministry. That had to go. We ended up doing very menial jobs like door to door selling and selling in flea markets to make a living (very good for us). We died to our own ambitions and desire for the limelight. Finally I got to the stage of “even though he slay me, yet will I trust him.” I would trust God even if he never chose to use me in his kingdom again. We were back in the UK at the end of this time for a conference. I remember very clearly–I was standing gazing out the window of the conference center at the beautiful British countryside, and out of the blue God spoke: “You’ll be part of a movement of God again a second time.” We had been part of a wonderful move of God in the UK–part the charismatic movement and part what was known as the British House Church movement. It was an amazing time of incredible blessing. And now God was promising the same again? And from that time onwards, he started speaking. Next Next post: Women as elders and deacons?